Protesters stage a rally in front of the National Diet building in Tokyo, Aug. 30, 2015. 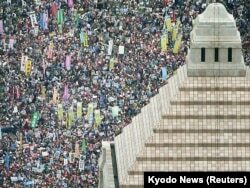 Tens of thousands of Japanese gathered near parliament in Tokyo Sunday to protest legislation that would authorize the military to fight abroad for the first time since World War Two. In one of the largest protests in Japan in recent years, crowds chanted "No war" and "Abe, quit" as a number of police tried to maintain order. The Tokyo protest was one of hundreds planned across Japan against Prime Minister Shinzo Abe's security policy and plan to modify the nation's post-war, pacifist constitution's military constraints. In July, Japan's lower house of parliament passed a group of bills that would allow the country's self-defense forces to engage in combat to defend an ally that comes under attack. The upper house of parliament is now debating those bills and is expected to pass them into law by the end of September. Under its constitution, Japan can only use force in cases of self-defense. People hold placards and shout slogans as they gather to protest against Japan's Prime Minister Shinzo Abe's security bill outside the parliament in Tokyo, Aug. 30, 2015. But Abe and his supporters have said Japan needs to increase the scope and power of its military to counter potential threats from countries such as China and North Korea, which are increasing their military and nuclear capabilities. "The security situation surrounding Japan is becoming increasingly challenging. With this in mind, it is an absolutely necessary legislation to protect the lives of the Japanese and also to prevent the country from going to war," Abe said about the new security measures earlier this year. A Ministry of Defense paper entitled “Defense of Japan 2015” highlighted China’s provocative and “coercive” efforts to stake out disputed maritime claims in the East China Sea that include the construction of an offshore gas platform. The security bills would revise 10 existing laws and would give the military more latitude to defend its people and interests, to participate in collective self-defense, and defend allies such as the United States. But many Japanese strongly support Article 9 of their postwar constitution, which renounces the use of offensive force to wage war or settle international disputes.